CLICK HERE to view the InglisTV Day 3 Summary. 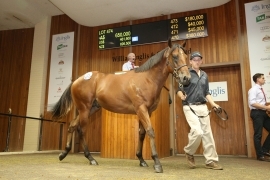 Inglis’ Make-An-Offer Service is available for lots which passed-in during Session I of the Inglis Premier Yearling Sale. The fourth and final day of the auction starts at 10:30am tomorrow, where Lots 574 to 755 will be offered and will be broadcast on Inglis Sale Day Live, plus Online Bidding and Make-An-Offer will again be available.